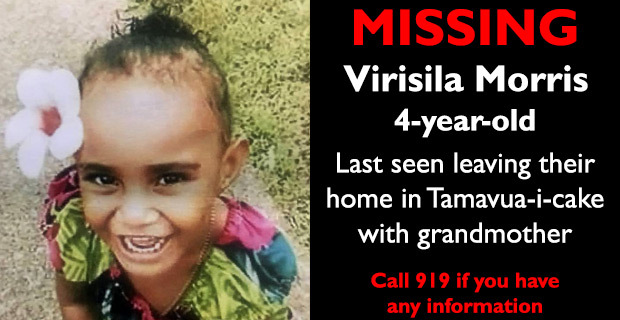 Police are still looking for four‑year old Virisila Morris who has been reported missing by her mother and is believed to be with a relative. Police say Morris was last seen leaving their home in Tamavua‑i‑cake with her grandmother on Monday morning without her parent’s knowledge and consent. Police say when she failed to return home and after several attempts at contacting relatives, a report was lodged at the Valelevu Police Station yesterday. Anyone with information is requested to call Crime Stoppers on 919.